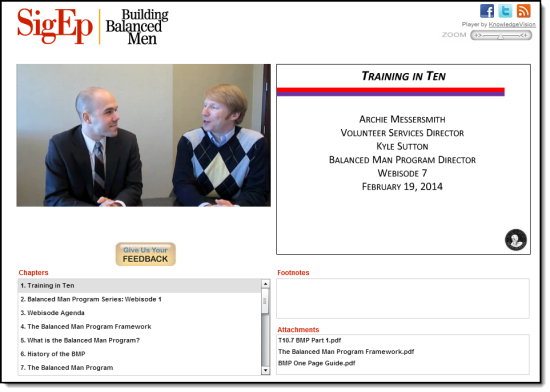 In this week's Training in Ten, SigEp's Balanced Man Program Director Kyle Sutton, Cincinnati '12, begins a four part webisode series on the Balanced Man Program (BMP) and how you can support it as a volunteer. Part 1 focuses on a general introduction to the BMP and then walks viewers through both the BMP history and its philosophy. The remaining three webisodes, including one that will feature questions submitted about the BMP by YOU, will be released in the coming months. Click on the image to go through to the webisode.